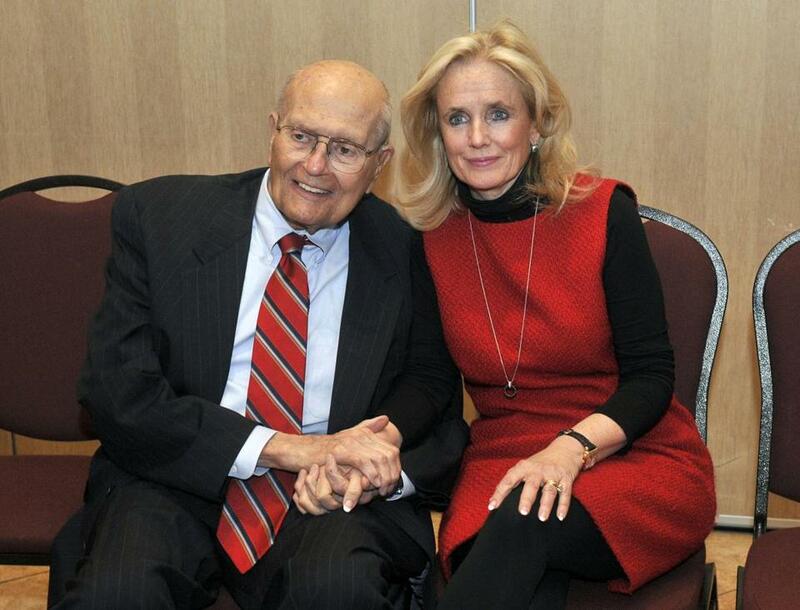 John and Debbie Dingell in 2014. DETROIT (AP) — Former U.S. Rep. John Dingell, the longest-serving member of Congress in American history who mastered legislative deal-making and was fiercely protective of Detroit’s auto industry, has died. The Michigan Democrat was 92. Dingell, who served in the U.S. House for 59 years before retiring in 2014, died Thursday at his home in Dearborn, said his wife, Congresswoman Debbie Dingell. Dubbed ‘‘Big John’’ for his imposing 6-foot-3 frame and sometimes intimidating manner, a reputation bolstered by the wild game heads decorating his Washington office, Dingell served with every president from Dwight D. Eisenhower to Barack Obama. He was a longtime supporter of universal health care, a cause he adopted from his late father, whom he replaced in Congress in 1955. He also was known as a dogged pursuer of government waste and fraud, and even helped take down two top presidential aides while leading the investigative arm of the powerful House Energy and Commerce Committee, which he chaired for 14 years. Dingell had a front-row seat for the passage of landmark legislation he supported, including Medicare, the Endangered Species Act and the Clean Water Act, but also for the Clean Air Act, which he was accused of stalling to help auto interests. His hometown, the Detroit suburb of Dearborn, was home to a Ford Motor Co. factory that was once the largest in the world. Yet one of his proudest moments came in 2010, when he sat next to Obama as the $938 billion health care overhaul was signed into law. Dingell had introduced a universal health care coverage bill in each of his terms. Dingell’s investigations helped lead to the criminal conviction of one of President Ronald Reagan’s top advisers, Michael Deaver, for lying under oath, and to the resignation of Reagan’s first environmental protection chief and U.S. Supreme Court Justice Neil Gorsuch’s mother, Anne Gorsuch Burford. She stepped down after refusing to share subpoenaed documents with a House subcommittee investigating a Superfund toxic waste program. Another probe led to the resignation of former Stanford University President Donald Kennedy after the school misused hundreds of millions of dollars in federal research funds. Dingell often used his dry wit to amuse his friends and sting opponents. Even when hospitalized in 2003, following an operation to open a blocked artery, he maintained his humor: ‘‘I'm happy to inform the Republican leadership that I fully intend to be present to vote against their harmful and shameless tax giveaway package,’’ he said from the hospital. Critics called him overpowering and intimidating, a reputation boosted by the head of a 500-pound wild boar that looked at visitors to his Washington office. The story behind it? Dingell is said to have felled the animal with a pistol as it charged him during a hunting trip in Soviet Georgia. The avid hunter and sportsman also loved classical music and ballet. His first date with his wife, Debbie, a former prominent Democratic activist whom he affectionately introduced as ‘‘the lovely Deborah,’’ was a performance of the American Ballet Theater. Born in Colorado Springs, Colorado, on July 8, 1926, John David Dingell Jr. grew up in Michigan, where his father was elected to Congress as a ‘‘New Deal’’ Democrat in 1932. After a brief stint in the Army near the end of World War II, the younger Dingell earned his bachelor’s and law degrees from Georgetown University. Following the sudden death of his father in September 1955, Dingell — then a 29-year-old attorney — won a special election to succeed him. The newly elected politician was no stranger to the Capitol. Dingell was serving as a page on the House floor when President Roosevelt asked Congress to declare war on Japan on Dec. 8, 1941. In college, he supervised the building’s elevator operators. And when he became the longest-serving U.S. House member in history in 2009, Dingell recalled entering the chamber for the first time as a 6-year-old and being in awe of the East door. Dingell, at age 87, announced in early 2014 that he would not run for a 30th full term because he could not have lived up to his own standards. Continuing the family tradition, his wife, Debbie, successfully ran for her husband’s seat in 2014. ‘‘I don’t want people to be sorry for me. ... I don’t want to be going out feet-first, and I don’t want to do less than an adequate job,’’ said Dingell, who by that time was using a cane or motorized cart to get around the Capitol. Dingell suffered a heart attack four years later, in September 2018 at age 92. He was hospitalized but was soon ‘‘cracking jokes as usual,’’ his wife said at the time. An autobiography, ‘‘The Dean: The Best Seat in the House,’’ was written with David Bender and published in December. Forewords were written by former President George H.W. Bush, who died only a few days before its publication, and former Vice President Joe Biden. Dingell had 252,000 followers on Twitter, which was an outlet for the outspoken Democrat’s wry takes and quick wit. In January, he noted the negative 7-degree temperature in Hell, Michigan, and retweeted a tweet from the Detroit Free Press that said the ‘‘Detroit Lions are going to win the Super Bowl’’ now that Hell had frozen over.